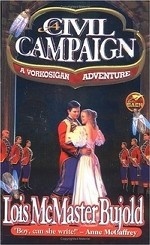 Аннотация к книге "A Civil Campaign"
Miles Vorkosigan has a problem: unrequited love for the beautiful widow Ekaterin Vorsoisson, violently allergic to marriage after her first exposure. If a frontal assault won`t do, Miles thinks, try subterfuge. He has a cunning Lord Mark Vorkosigan also has a problem: his love has just become unrequited again. But he has a cunning Lord Ivan Vorpatril has a problem: unrequited love in general. But he too has a cunning If no battle plan survives first contact with the enymy, just imagine what all Miles` friends and relatives can do to his romantic strategy!